I’m very proud to announce that my band LUSTER has a record out: a split with HELLVETE. Glenn of Hellvete also recorded our track. Luster is a new band, or – one could say – an old band that finally decided on a name. The recording features Lobke D’Hespeel (Mote, Joe Speedboat), Yumi Verplancke and Steve Marreyt (both make guest appearances on ‘nest’ and my new record – more about that later – ‘debris’), Julie Lafontaine and Jelle Vanlerberghe (Joe Speedboat). Elisabeth Cornille has joined the band more recently. On the split 10 inch we present our version of ‘are you going to leave me’ (a traditional). Morc records says it is a kind of mix between Shirley Collins and OM, and I think that might be quite right. 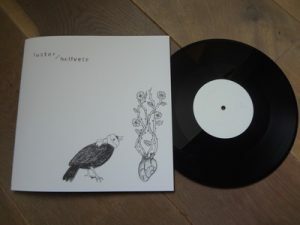 the record is a ltd edition 10″ – due to an underrun in the plant only 130 copies were made – and comes in a gorgeous sleeve designed by Belgian artist Mart Vanden Abbeele, with a download coupon. you can find some more details, listen to the tracks and look at the artwork on here. it’s yours for 12 euro + shipping (approx 8 euro to most countries worldwide) – you can order by replying to this mail, or via http://www.morctapes.com/store.html. if you’re after the digital version, morctapes.bandcamp.com is the place to go. (however, please don’t order the 10″ via that link – shipping price will be too high for some countries).